Bread has been eaten with any meat or vegetables since Neolithic times. For example, the ancient Jewish sage Hillel the Elder is said to have placed meat from the Paschal lamb and bitter herbs between two pieces of matzah (or flat, unleavened bread) during Passover. During the Middle Ages, thick slabs of coarse and usually stale bread, called "trenchers", were used as plates. After a meal, the food-soaked trencher was fed to a dog or to beggars, or eaten by the diner. Trenchers were the precursors of open-face sandwiches. The immediate cultural precursor with a direct connection to the English sandwich was to be found in the Netherlands of the 17th century, where the naturalist John Ray observed that in the taverns beef hung from the rafters which they cut into thin slices and eat with bread and butter laying the slices upon the butter, explanatory specifications that reveal the Dutch belegde broodje was as yet unfamiliar in England. Initially perceived as food men shared while gaming and drinking at night, the sandwich slowly began appearing in polite society as a late night meal among the aristocracy. The sandwich's popularity in Spain and England increased dramatically during the 19th century, when the rise of an industrial society and the working classes made fast, portable, and inexpensive meals essential. What is your favorite breakfast sandwich? Leave me a comment. I love hearing from you. Beat eggs until smooth. In skillet melt butter over low heat. Pour eggs into preheated skillet, season with salt and pepper. Stir. Remove from heat when there is no more liquid on bottom of skillet. Spread butter on toast, add American cheese, deli ham and scrambled eggs. Enjoy! Sounds great Christine! I love a good egg sandwich, either fried or scrambled. For some reason I never thought to add meat to it. In the western society, sandwiches is always the most popular lunch. It's simple, easy to made and can be creative as well. I love bacon and egg sandwich if I want a big breakfast! For lunch, I love chicken with avocado! The old dependable ham and egg sandwich looks delicious! And great info as well on the origins of the sandwich. Great post! We have gotten away from breakfast sandwiches with all the b'fast burritos out there. This does look tasty-well done Christine. Great sandwiches. Can't go wrong with bacon and chicken. I love spicy fried chicken breast with tomatoes and lettuce:D Yours looks really good! I would love that too! My husband loves fries egg sandwiches, and will eat them for breakfast or lunch. Me, I'm not much of sandwich eater, unless it's turkey or tuna. However, your breakfast sandwich does look yummy! This looks SO GOOD. Yum!!! I love scrambled eggs and cheese on a bagel for a breakfast sandwich. And, I love egg salad with smoked salmon. The sandwich is such a good thing! Hi Christine, I just had similar andwich for lunch - mine was sunny side up (kids drop all the eggs when I made scrumbles). I know this is good sandwich! I should try with American cheese next - I used cheddar cheese today. This sandwich looks like it would be a great breakfast sandwich! ....but who doesn't love the ham & egg sandwich? Well, I actually never had sandwiches for the breakfast...no idea why. I would love this ham and egg sandwich for the lunch! Looks delish. Simple to make, delicious in taste!! I am not much of a Ham lover but egg salad sandwich .. any time! We so love your food history! As far as your sandwich, it's perfect! 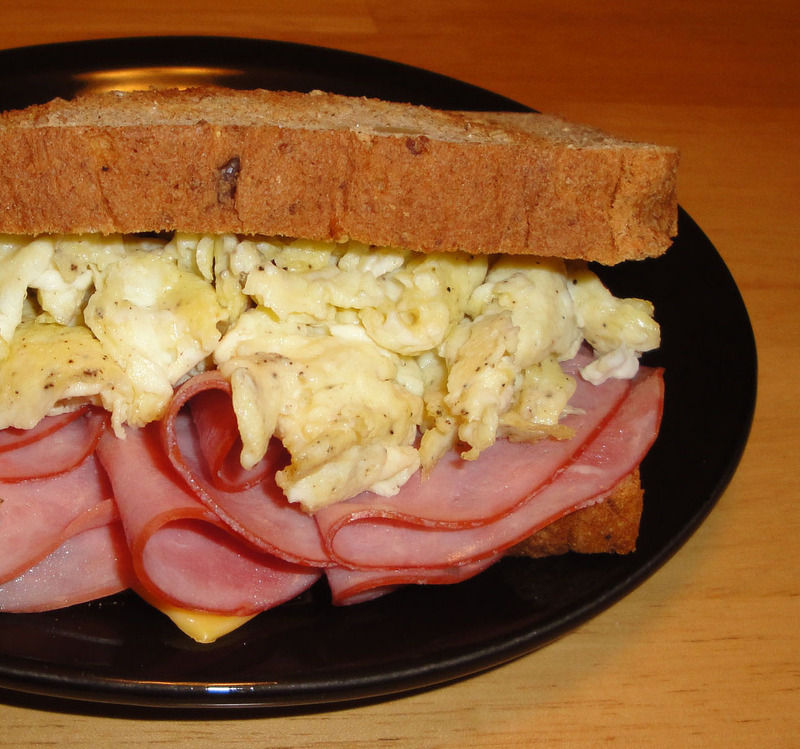 Ham and eggs are a favorite around here, and the sandwich makes a perfect lunch!